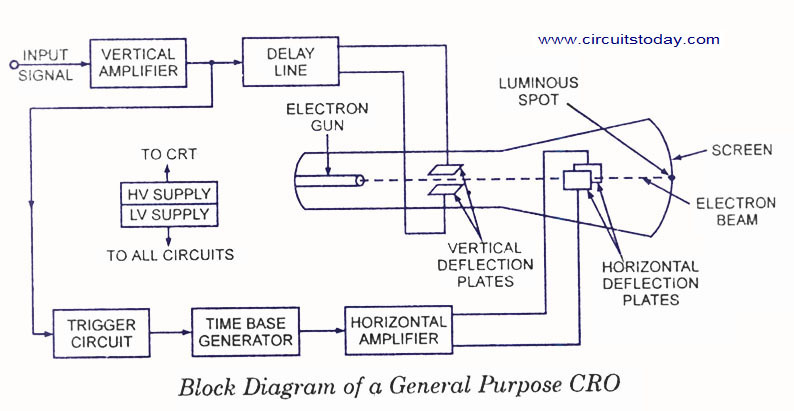 A CRO (Cathode Ray Oscilloscope) is an electronic instrument used for studying various electrical & electronic parameters and behaviors. CRO is basically an XY (2 dimensional) plotter which can plot an input signal vs another signal or an input signal vs time. A cathode ray oscilloscope is used to study waveforms, transients, time based or frequency based analysis. The cathode ray oscilloscope is an extremely useful and versatile laboratory instrument used for studying wave shapes of alternating currents and voltages as well as for measÂ­urement of voltage, current, power and frequency, in fact, almost any quantity that involves amplitude and waveform. It allows the user to see the amplitude of electrical signals as a function of time on the screen. It is widely used for trouble shooting radio and TV receivers as well as laboratory work involving research and” design. It can also be employed for studying the wave shape of a signal with respect to amplitude distortion and deviation from the normal. In true sense the cathode ray oscilloscope has been one of the most important tools in the design and development of modern electronic circuits. Buyers Guide â€“ We have developed an excellent buyers guide for people who are looking to buy a CRO. So here is our first guide toÂ Buy an Analog Oscilloscope â€“ which explains which all features to look for, compares the topÂ selling products and much more. 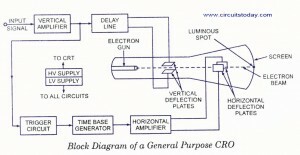 The instrument employs a cathode ray tube (CRT), which is the heart of the oscilloscope. It generates the electron beam, accelÂ­erates the beam to a high velocity, deflects the beam to create the image, and contains a phosphor screen where the electron beam eventually becomes visible. For accomplishing these tasks various electricalÂ Â Â Â Â Â Â Â Â Â signals and voltages are required, which are provided by the power supply circuit of the oscilloscope. Low voltage supply is required for the heater of the electron gun for genÂ­eration of electron beam and high voltage, of the order of few thousand volts, is required for cathode ray tube to accelerate the beam. Normal voltage supply, say a few hundred volts, is required for other control circuits of the oscilloscope. Horizontal and vertical deflection plates are fitted between electron gun and screen to deflect the beam according to input signal. Electron beam strikes the screen and creates a visible spot. This spot is deflected on the screen in horizontal direction (X-axis) with constant time dependent rate. This is accomplished by a time base circuit providedÂ in the oscilloscope. The signal to be viewed is supplied to the vertical deflection plates through the vertical amplifier, which raises the potential of the input signal to a level that will provide usable deflection of the electron beam. Now electron beam deflects in two directions, horizontal on X-axis and vertical on Y-axis. A triggering circuit is provided for synchronizing two types of deflections so that horizontal deflection starts at the same point of the input vertical signal each time it sweeps. A basic block diagram of a general purpose oscilloscope is shown in figure. Cathode ray tube and its various components will be discussed in the following Arts. it is very good and is better than others. An oscilloscope cannot measure current or power. It measures voltage, in various forms, but it cannot measure current without using an external shunt resister and calculating it yourself, and it cannot measure power without knowing both the voltage and current. Thank you very much it was usefull for me in understanding cro better…..
i need complete using procedure on cro . It is very useful information to me. Hi Ankit go through the wiki site full of details. i need complete information in cro & function of cro. Each component of the oscilloscope has very important function. If one of them fails, it will give faulty readings.